The teachers’ union is suing the Tamaqua Area School District in Schuylkill County over a policy providing for teachers and other school employees to carry firearms. The teachers' union in a Schuylkill County, Pa., school district has filed a lawsuit against the district over a recently passed policy that would let employees carry firearms on school grounds, saying the provision violates state law, and has asked a judge for an injunction to prevent the district from implementing the measure in its current form. The case could have statewide implications for whether school districts are authorized to enact armed-teacher policies. The Tamaqua Area School District is the first in Pennsylvania to attempt to implement a program of this kind. State law prohibits the possession of weapons on school property except for a "lawful purpose" but does not define that term, according to the state Department of Education. The Tamaqua Education Association alleges that state law allows only police officers and school resource officers with specific training to carry weapons on campus and that school employees, under the district's policy, would not have the training required by law. Tamaqua does not have school resource officers. "The district's policy ignores state law and allows school employees who do not have state-required training or experience to carry and use firearms," said Frank Wenzel, president of the Tamaqua teachers' union, in a statement released Wednesday by the Pennsylvania State Education Association. School board president Larry Wittig contended that was untrue, saying that employees would be adequately trained and that the district was already following the law. "The injunction application, they can go through that. That's not going to stop us," Wittig said. "If we have to define it more strictly or have three or four policies that address the entire safety program of Tamaqua, so be it; we'll do that, too, but I think PSEA is trying to put a shot across the bow." The complaint asks a judge to "declare the policy void and unlawful to the extent that it conflicts with the school code" and prevent the district from implementing it in its current form. "The policy exceeds the powers granted to the district by the General Assembly and violates the School Code, because it authorizes government employees to carry firearms in schools and to use deadly force when such government employees have not been authorized to carry firearms by the General Assembly," the complaint says. A bill explicitly allowing districts to enact armed-employee policies failed to pass in the state House this year. Gov. Wolf had said he would veto it, maintaining that only police and school resource officers should be armed on campuses. One other school district in the state has four armed maintenance staff members, but does not arm teachers or other employees. 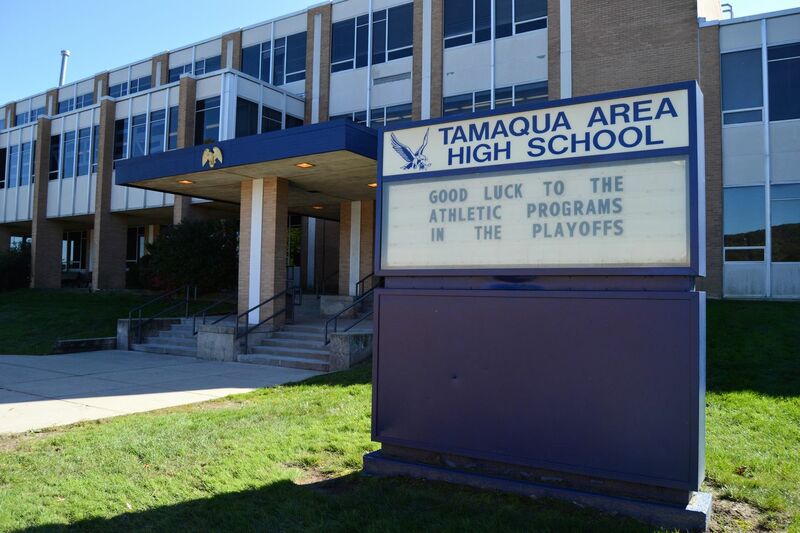 The Tamaqua policy was quietly passed in September by school board members, who say they are trying to prepare the district's four schools to respond to an active shooter. "There's no law that says you can do it, and there's no law that says you can't do it, so I think we're good," school board member Nicholas Boyle, who spearheaded the effort, said last month. Parents and the teachers' union have protested, last week gathering for an hours-long meeting to present alternative proposals. Boyle and Wittig said the board would consider all alternatives presented at the November meeting and could change what is known as Policy 705. At the meeting, the school board invited a representative from a firearms training program to present to the audience and field questions. Parents presented various proposals for detecting shooters, data about school shootings, and ideas for increasing preventative services and security. Some said they would prefer school resource officers; others questioned the board's research. "We're still in the dark about what the board looked at and who the board consulted prior to the policy [being] adopted," said Cheryl Tennant Humes, one of the residents opposed to the policy who presented at the meeting. "There's no explanation, no reason, why we should trust them to drag us all as a district, as taxpayers … as employees, as teachers, and as students into uncharted legal terrain." The school board is now looking into an active shooter alert system mentioned by parents and may consider minor changes to the policy, Wittig said Wednesday. However, the school board has no plans to eliminate the policy. "We're not going to rescind 705," Wittig said.